Kitchener's progressive stoner metal doomsters Sierra kicked off the festivities at the Hard Luck Bar, and impressed everyone with the quality of their set. Characterized by huge, fat riffs and delightfully wallowing song structures, the texture of their guitar tone was surprisingly excellent, with just the right quantities of fuzz and smoke. Their set was punctuated with almost identical announcements that "this next song is about being on a whole bunch of drugs!" There was a loose, jangly quality to the performance that served their stoner identity well but occasionally made their songs fall a little too far apart; they would be served well by being just a bit tighter. But the moments that they were focused were captivating. The energy in the room changed completely when experimental grindcore scientists Today Is the Day took over the proceedings. 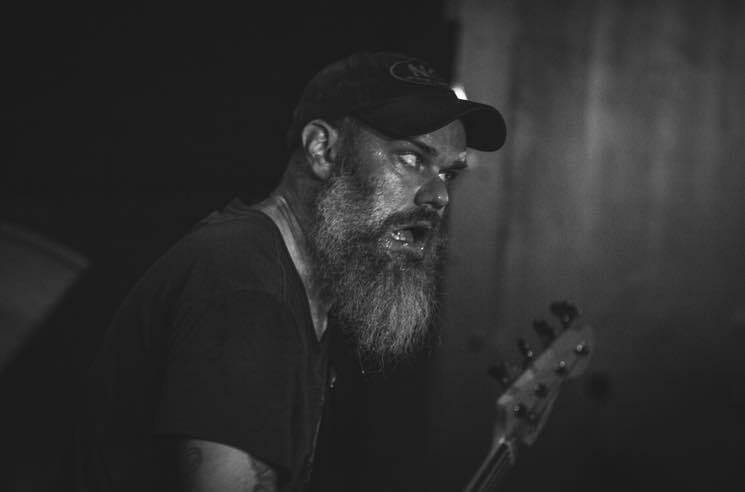 Guitarist and vocalist Steve Austin has long led the project with an iron will and blistering intensity; on stage he gives the impression of a mad preacher. Their set was a raw and organic interpretation of their particular version of aural violence, with only very spare samples and triggered effects. While the occasional broken, digitized voice made their performance spookier, their focus for this performance was raw violence. Rather than reaching for the surgical equipment, they opted to do all of their damage with a flail. When Author & Punisher are preparing to perform, it's not entirely certain whether a laboratory or a torture chamber is being built on stage. There is a kind of still thread contained in all of the custom machinery that Tristan Shone builds and uses on stage, a weird dormant threat, from the weights he hands from a drum machine that looks like and futuristic work bench to the secondary microphone plate he straps around his neck to better pick up (and distort) the noises in his throat while he screams. Watching him control the machinery with every available part of his body — hands pressing keys or adjusting knobs or slamming levers, feet on pedals, lips wrapped around the weird flat curvature of his customized mic — is mesmerizing and terrifying. It is impossible for Author & Punisher not to steal whatever show the solo project is a part of. By the time the too-brief set closed with the grotesque futuristic march of "Flesh Ants," the audience was both won over and overwhelmed by the strange industrial doom maelstrom that he's conjured. However mean and gritty they like to make their stoner metal, North Carolina's "smoke doom" stoners Weedeater manage to retain a kind of gleeful repulsiveness that seemed all the more bright and cheery following the industrial horror of their direct support. Hell, their intro was "Putting on the Ritz" from Young Frankenstein. Their intensely fuzzed-out tone was complimented by their absurdly high energy level, which proved infectious as the first real mosh pit of the night broke out early on in their set. The stage arrangement they chose was unconventional, placing the drummer at the front of the stage, making the rhythm section a focal point and increasing the sense of furious energy in their set. Dixie Dave's voice is a sandblasted rasp; there was something almost demonic about the way he demanded someone get him a drink, but for all the implied infernal treachery there is something damn charming about the way he capers about on stage, maniacal and grinning.